The sauces allowed me to turn a mistake into a pretty decent meal, even if it was served with a mixture of mismatched pastas. I made a roasted garlic béchamel for Terry, of which a portion was incorporated to the tomato sauce for me. Looking back over the recipe again, I think I was not supposed to dump all the gnocchi into a strainer but instead, put the cooked gnocchi into a pan with the sauce. Oh well! Maybe you’ll have better luck! Should you choose to try this on your own, here are the ingredients and instructions for each component. Gnocchi recipe from Bon Appetit can be found here. Add the onion piquet to the milk in a heavy sauce pan and simmer for 20 minutes. Remove the onion piquet from the milk. Add the roux a little at a time until the sauce reaches a thicker consistency. Continue to cook until the sauce is reduced by about a third. 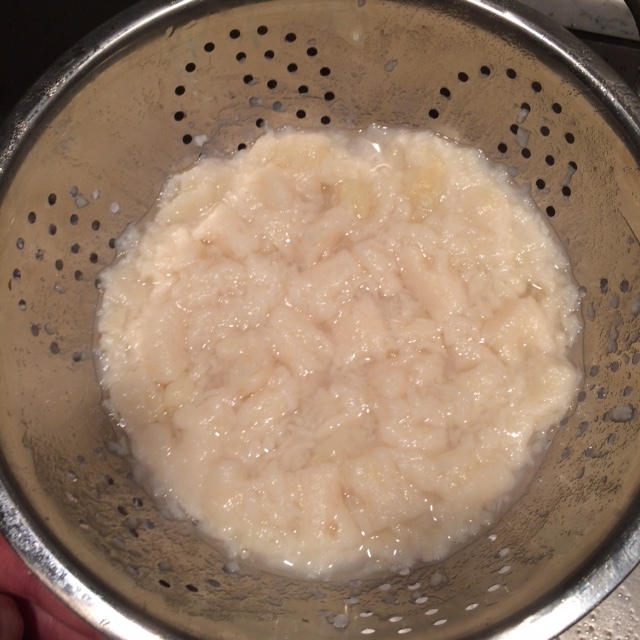 Transfer the sauce and garlic to a food processor and pulse until garlic is well incorporated. Put the sauce back on low heat, add the parmesan and stir until incorporated. Sauce can be served immediately. Sauté pork until fat is rendered. Add sachet, stock and bones. Allow sauce to simmer for 45 minutes. Sauce will naturally reduce and can be pureed and strained or served as-is. 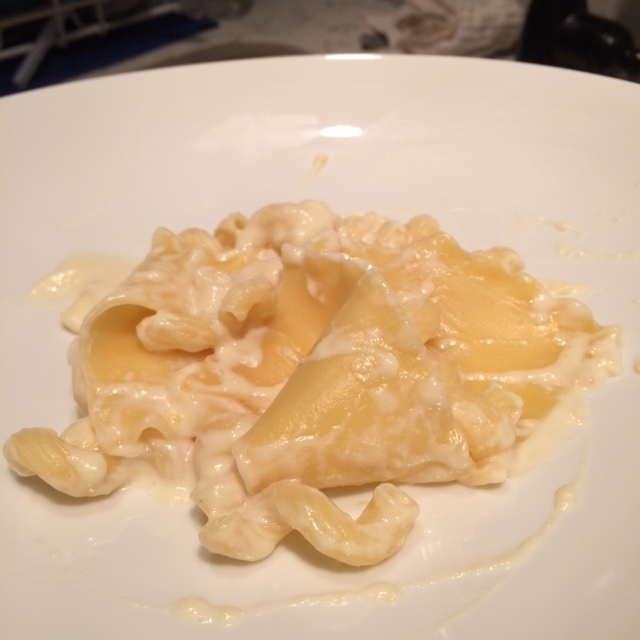 Sad pasta with yummy roasted garlic bechamel! 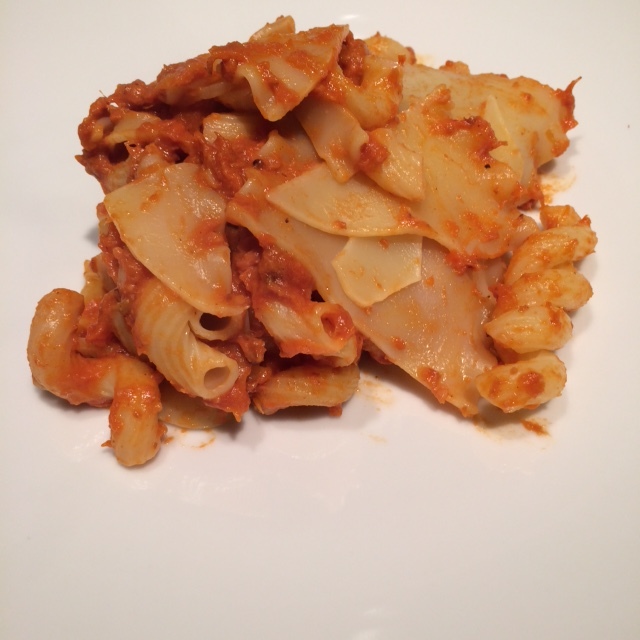 Sad pasta with yummy tomato sauce!